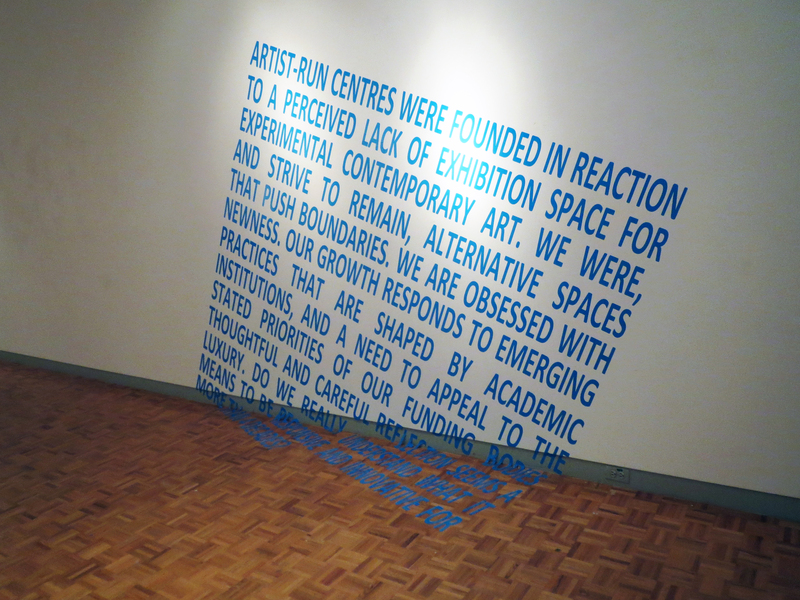 After reflecting on the history of the White Water Gallery as well as several other Artist-run Centre’s Curators Fynn Leitch and Clayton Windatt generated the following text as a summary. It was installed at the WKP Kennedy Gallery on behalf of the White Water Gallery, at Ice Follies 2014: Ohkwamingininiwug on the frozen Ice of Lake Nipissing and at Artspace in Peterborough. Each site has significant relevance to each statement and the meaning behind each piece connects to the space. 1) ARTIST-RUN CENTRES WERE FOUNDED IN REACTION TO A PERCIEVED LACK OF EXHIBITION SPACE FOR EXPERIMENTAL CONTEMPORARY ART. WE WERE, AND STRIVE TO REMAIN, ALTERNATIVE SPACES THAT PUSH BOUNDARIES. WE ARE OBSESSED WITH NEWNESS. OUR GROWTH RESPONDS TO EMERGING PRACTICES THAT ARE SHAPED BY ACADEMIC INSTITUTIONS, AND A NEED TO APPEAL TO THE STATED PRIORITIES OF OUR FUNDING BODIES. THOUGHTFUL AND CAREFUL REFLECTION SEEMS A LUXURY. DO WE REALLY UNDERSTAND WHAT IT MEANS TO BE RESPONSIVE AND INNOVATIVE FOR MORE THAN 4 DECADES? 2) AS WE GROW, THE QUESTION OF FOLLOWING OUR ROOTS BECOMES PRESSING. RESPECTING OUR ORIGINS IS IMPORTANT BUT IS THIS EVEN POSSIBLE GIVEN THE CURRENT ENVIRONMENT? IS THE CLIMATE FLEXIBLE ENOUGH TO ACCOMMODATE A NEW MODEL OF EXISTENCE THAT ALLOWS FOR THOUGHTFUL REFLECTION AND AN INTEREST IN THE PAST? 3) THE STRUGGLE TO SURVIVE ON INCREASINGLY SCARCE RESOURCES CAN BREED COMPETITION, FEAR, AND THE WILLINGNESS TO COMPROMISE. STRENGTH DURING THIS TIME OF RENEWAL IS CRITICAL AND WE NEED TO STICK TOGETHER. IT IS EASY TO BECOME CYNICAL, ESPECIALLY AT OUR AGE, BUT NOW IS THE TIME FOR OPTIMISM. 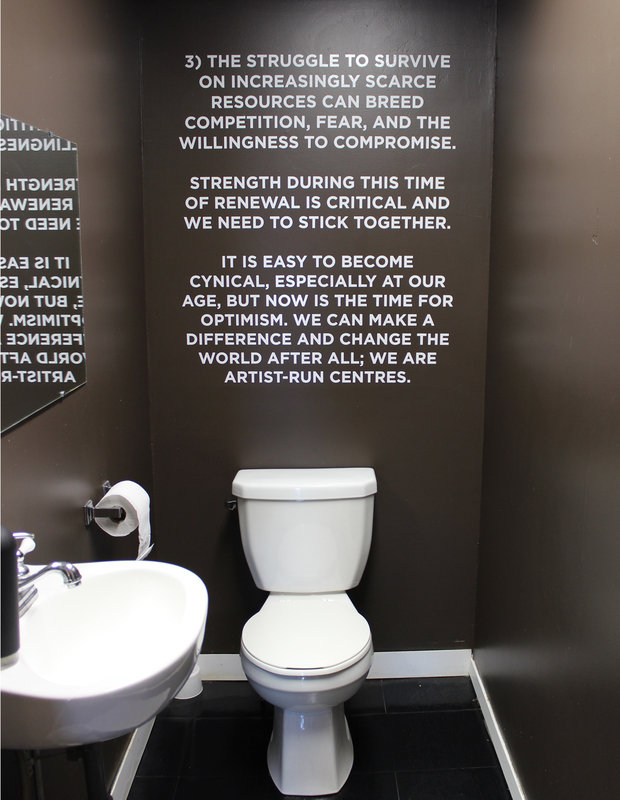 WE CAN MAKE A DIFFERENCE AND CHANGE THE WORLD AFTER ALL; WE ARE ARTIST-RUN CENTRES. These statements lead towards an additional campaign where Fynn Leitch took the conversation further at the Festival of Alternative Art Sudbury (FAAS4) which was conducted by La Galerie du Nouvel-Ontario in Sudbury. 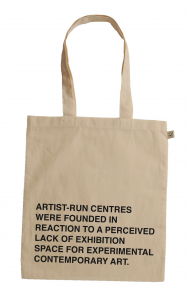 The Hyperbolic ARC was created as a result and a series of slogans were produced on tote bags furthering the temporary nature of our existence and emphasizing many of the changes that we are facing in Artist-Run Centres today. 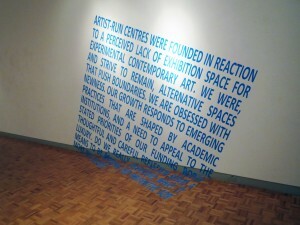 http://youtu.be/q0q043rFJL4 La Galerie du Nouvel-Ontario’s FAAS4 was a great experience this year. White Water Gallery programmed Fynn Leitch and her latest work, “Mid-Life Crisis//Hyperbolic ARC”. The Rainbow Centre Mall in Sudbury was alive with activity! 40 years after its founding, 10 years after a major flood, 2 years after PAARC’s Institutions by Artists, and 1 year after MANO/RAMO’s Evolve or Perish, ARTSPACE, like many artist-run centres across the country, is in a state of intense self-reflection; a mid-life crisis of sorts. We are taking time to reevaluate what we are and what we do. We question our relevance; we argue for our relevance; we reposition our relevance. We pose these questions on our own and with our peers. We are smart people. We think about these things a lot. Our answers are complicated, peppered with optimism and pessimism. To our funders, we exude confidence, providing clear and concise answers. We want to survive, and we should. The climate in which we exist is much different than the one in which we were founded. Funding constraints are a constant and growing concern. The provincial and federal agencies have implemented a decrease policy while an increase policy is, as yet, undrafted and shifted the language of “engagement” and “profile” to “market access”. But, in much the same way that survivors of the great depression learned how to manage money, we know how to strive under lean conditions. We are resourceful. We are frugal. We are hopeful. 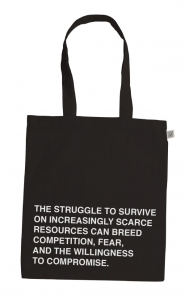 Most of all, we are in this together … For this iteration, a text has been reworked and printed on limited edition tote bags. It was first exhibited in three parts at three locations: the WKP Kennedy Gallery, Ice Follies 2014, and ARTSPACE. Responding to the infrastructures of consumerism, (the shopping mall, the shopping cart, the tote bag, the internet), that compose its site, this project places the conversation alongside the myth of consumerism as it relates to identity, trend, and economy. Participating ARCs of FAAS4 are invited to rifle through the piles of stuff that tends to accumulate in our spaces, and gather a tote bag sized contribution of materials. The audience will be invited to search through the contents of the bags, share knowing glances and raised eyebrows, debate, hug, strategize, engage in nostalgia, and take a souvenir. 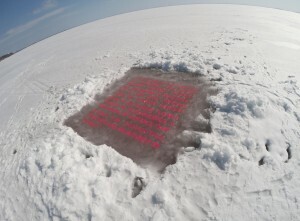 Fynn Leitch has an MA in Visual Culture from Queen’s University (2006) where her work focused at the intersection of craft and protest. Since 2011 she has led the direction of ARTSPACE, including the development of an onsite Media Lab, and has renewed the centre’s commitment to critical writing and publishing. Curator, writer, and artist, her work has appeared in catalogues, magazines, and galleries across the country. She also works as an advocate for the arts regionally and provincially.